Nira Berry, motivating speaker, Happiness Coach and workshop leader presents her LaughingRx programs as a fun, uplifting interactive laughter experience for corporate events, team building programs, and wellness experiences. Nira Berry is an inspiring and motivational speaker, known worldwide for her LaughingRx team building workshops & interactive keynote speaking. Nira is a laughter Therapist, and is a stress reduction expert who leads and facilitates retreats and workshops. Nira is a Certified Laughter Yoga Teacher and a Certified Life Coach specializing in your Personal Development- every aspect from your career, to health, happiness to business. Nira is known worldwide as the Happiness Coach. Nira has changed people's lives within the workplace and beyond by teaching them how to "Lighten up"
Nira's Goal: Guiding you to live joyfully with laughter"
Nira Berry offers laughter therapy & laughter yoga & Happiness Coaching. "Fake it, Fake it, until you make it!" Scientific Studies have shown that your body can't tell the difference if you are faking laughter or really laughing! You get the same health and positive emotional benefits of laughter either way! We start out faking and then start really laughing using laughter exercises led by Nira. Everyone can laugh at any age, without relying on jokes or comedy. All abilities. Flexibility is not necessary - no poses, just laughter mingling. LaughingRx can be modified for groups of all kinds - less or more active, it's all tailored to your needs. The benefits of laughter can be achieved while sitting or standing! DVD info: Experience the joy of laughing exercises while following along a Laughter Yoga Class led by Nira Berry. Laugh at home on your own or with a group of friends! For all ages and abilities. "Nira's skill and laughing energy is contagious. We all felt better and have never laughed as much. "I attended a seminar led by Nira at Suburban Hospital - WOW ! The sound of all 300 people laughing together was very powerful. " 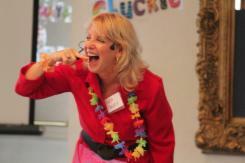 Interested in LaughingRx and booking Nira for an inspiring and motivating presentation?